To apply for housing at College of Saint Mary, simply complete the online application. Campus housing is restricted to full time students studying for undergraduate degrees at CSM. However, if a student completed her undergraduate work at CSM and is continuing on as a full time student for a graduate degree at CSM, she may live in the residence halls during her graduate studies. This is only applicable for new students who have not been living on campus. Your $125 housing deposit will be forfeited if you cancel your housing assignment after June 28, 2019. All First or Second-Year Full-Time Undergraduate Students under the Age of 21 ARE REQUIRED to live in the residence halls unless they have submitted the Required Residence Exemption/Exception Form and received approval from the Director of Residence Life and Community Standards one month before classes begin each semester. 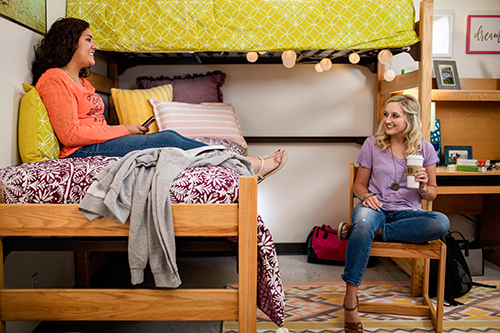 Students receiving room and board as part of a scholarship or grant ARE REQUIRED to live in the residence halls. Should scholarship or grant students receiving room and board funds choose to live off campus, they will forfeit the scholarship or grant dollars that fund room and board. Full-Time Undergraduate Students at College of Saint Mary have first priority for all on-campus housing. All students living in the residence halls MUST participate in CSM's full board plan. Only students under the age of 35 will be considered for on-campus housing. Exceptions will only be made with the approval of the Director of Residence Life and Community Standards. You must have a debit or credit card ready to pay your deposit when filling out this application. Copyright © 2018 College of Saint Mary. All rights reserved.